Monday features a one-game slate between the Milwaukee Brewers and Los Angeles Dodgers for Game 3 of the NL Championship Series starting at 7:39 p.m. ET. Monday’s biggest tournaments on both DraftKings and FanDuel differ slightly from the traditional formats. DraftKings will feature its popular Showdown mode, in which you have six utility slots that can be filled by either a pitcher or batter. The only real rules are that you must roster at least one player from each team and can stack only four batters from the same team. Relief pitchers are also scored on a different basis than what is used for starting pitchers, which makes them viable options. FanDuel’s single-game format does not feature pitchers of any kind. Instead, you’ll have to fill out your roster with one infielder, one outfielder and three utilities, one of whom is designated as the MVP. 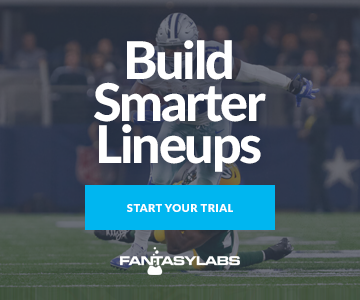 That player earns 1.5x fantasy points during the game, so choosing the correct player for that slot can make or break your lineup. Buehler was roughed up a bit in his most recent start, allowing five earned runs over five innings but he put together a dominant second half of the regular season. He pitched to a 2.03 ERA and 10.35 K/9 after the All-Star break, and his ERA dropped to a ridiculous 0.94 when pitching at Chavez Ravine. You could make a strong case that he’s the Dodgers’ best pitcher at this point. He has lots of upside tonight against the Brewers, who posted the sixth-highest strikeout rate against right-handed pitchers in 2018. They’re implied for just 3.2 runs, and Buehler is also a -180 favorite. Historically, pitchers with comparable marks in both categories have averaged a Plus/Minus of +2.13 on DraftKings (per the Trends tool). This is probably the best spot we’ll get for a starting pitcher all series. Things are a little more complicated for Chacin. He was solid during the regular season, pitching to a 3.50 ERA, and threw five scoreless innings against the Rockies in the NLDS. He’s also pitching on nine days’ rest, so fatigue shouldn’t be an issue. That said, there’s no guarantee that manager Craig Counsell will stick with Chacin for more than a couple of innings. Counsell pulled his Game 1 starter, Gio Gonzalez, after only two innings and will have a full arsenal of relief pitchers at his disposal. Even if Chacin does see a full workload, it’s possible that he won’t be able to take advantage. The Dodgers have been the best team in baseball this season against right-handed pitchers, ranking second in wOBA and first in wRC+. Chacin struggled in particular against left-handed batters this season — his wOBA against lefties was more than .100 points higher than his wOBA against righties — and the Dodgers will have all their big left-handed bats in the lineup. All of the big name relievers should be available after getting Sunday off. That likely means Josh Hader will pitch for the Brewers as long as this game stays competitive, and it’s hard not to like him in the Showdown format. He racked up 25.0 fantasy points in Game 1, and it’s virtually impossible to fade that kind of upside at $3,500. He pitched to a 2.43 ERA and 15.82 K/9 during the regular season, making him one of the best relievers in baseball. Corey Knebel served as the Brewers’ closer in Game 1, and he’s priced at $2,700. He makes a lot of sense if you think that the Brewers are in a position to win this game. Jeremy Jeffress could also be worthy of some consideration. He took the loss in Game 2 after giving up a two-run homer to Justin Turner, but pitched to a ridiculous 1.29 ERA during the regular season. Things aren’t as appealing on the Dodgers’ side, when you consider that they have an elite starter on the mound. That increases the chances that the relievers will enter the game in a hold or save situation but likely decreases the number of innings that will be available out of the pen. Kenley Jansen will get the call in a save situation and has been perfect over three postseason innings. He’s also tallied four strikeouts over that span and appears to be fully recovered from the heartbeat issue that caused him to miss some time during the regular season. Pedro Baez has been phenomenal for the Dodgers in a set-up role during the postseason. He’s racked up seven strikeouts and zero earned runs over 4.2 innings pitched but is still priced at the absolute minimum on DraftKings. This will be the first time that the Brewers have faced a right-handed starter in this series, and Shaw will move up to the cleanup spot in the order. He’s done the majority of his damage this season against traditional pitchers, posting a .374 wOBA and .285 ISO. A whopping 30 of his 32 regular-season home runs also came against right-handed pitchers, and he’s really affordable at $6,400 on DraftKings. Moustakas will also have the splits advantage against Buehler, although he wasn’t as effective as Shaw vs. right-handers during the regular season. Still, Moustakas posted a .337 wOBA and .230 ISO, both of which are above-average marks. Yelich isn’t as splits-dependent as Shaw and Moustakas, faring almost equally as well against righties and lefties in 2018, but is one of the best hitters on the planet. He displays more power against right-handers, however, posting a .281 ISO and clubbing 26 homers. His split-adjusted wRC+ of 159 on the road is the best mark on the team by a significant margin. Aguilar might not garner as much attention as the left-handed bats for the Brewers, but he was virtually just as successful against right-handers during the regular season. He posted a .368 wOBA and .263 ISO against traditional pitchers. Cain and Braun will occupy premium spots in the Brewers’ lineup, but both are worthy of some fade consideration. Both batters fared significantly worse against right-handed pitchers in 2018, and Braun in particular posted a dismal wRC+ of 67 when facing a right-hander away from Milwaukee. Pederson, Muncy and Bellinger will all draw their first starts of the series, which is not a surprise considering Chacin’s struggles vs. left-handed batters. All three guys can do some damage in this matchup, and Bellinger in particular looks like an excellent value at $7,700 on DraftKings. Puig is a classic reverse splits hitter, so don’t let the righty-righty matchup vs. Chacin scare you. He posted a .390 wOBA and .267 ISO against traditional pitchers in 2018, both of which were significantly higher than his marks against left-handers. Tuner and Machado will also be on the reverse side of their batting splits, but they’re two of the best hitters in baseball. Each posted a wRC+ of at least 139 vs. right-handers in 2018, so you can target them with confidence against Chacin.